Good news for the job seekers who are waiting for MDL Recruitment 2017 Notification. Now the Mazagon Dock Limited (MDL) organization has dispatched a notification to fill up 985 Technical Staff Openings. Job Fighters who are seriously preparing for Central Government Jobs they have to apply for MDL Recruitment 2017 Notification. Before filling the application form aspirants must refer the entire data and submit the application form before the closing dates. Those who are going to fill the application form they have specified education qualification. The candidates must be passed SSC or equivalent examination conducted by a Board recognized by the Government and National Apprenticeship Certificate Examination passed in the trade of “Refrigeration and Air Conditioning” from any recognized institute. After completion of the graduation, most of the peoples are showing their interest in Government Jobs. As well as the competition level is also very high. We suggest all the job seekers who are interested in MDL Technical Staff Recruitment 2017 must submit their application form. The candidates must submit their online application forms between 17th October 2017 to 29th October 2017. Through this page, you find more data such as Education Qualification, Age Limit, Selection Process, Application Fee, Age Limit, and Salary Details. Want to get clear stuff about MDL Jobs 2017 then scroll down this page. The Mazagon Dock Limited (MDL) has revealed a new notice to fill up 985 Technical Staff Openings. The candidates who want to get a placed in Mazagon Dock Limited (MDL) they must clear all the recruitment rounds. The officials will conduct the Written Test and Personal Interview for the applied contenders. Therefore coming to the Age Limit the candidates should not exceed 33 years. Refer the official advertisement which is provided at the edge of the page. From this page, we are providing all the MDL Recruitment 2017 Notification information. Interested contenders must collect the complete details about MDL Jobs 2017 from this page. After checking the entire information suitable candidates can fill the application form before the last date 17th October 2017. Download the application form and fill the required data in a detailed manner. After completion of the registration process, candidates can get the new syllabus and start the preparation. 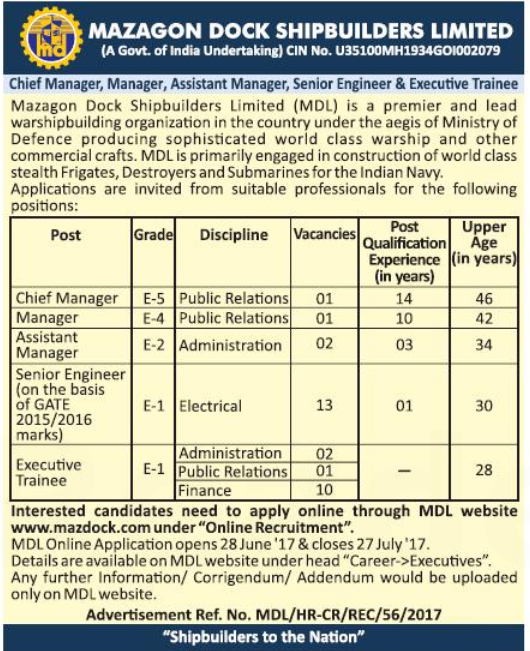 By visiting the official website of Mazagon Dock Limited (MDL) you can find more stuff related to MDL Openings 2017. More details you have to scroll down and check. Aspirants who are interested in Mazagon Dock Limited (MDL) Jobs they have to fill the online application form through online mode. The candidates must pay Rs. 140/- as application fee. General and OBC category aspirants are exempted from paying the application fee. We suggest all the candidates it is better to refer the official advertisement and apply for MDL Recruitment 2017. The selected aspirants will receive Rs. 6,000 to Rs. 8,000/- Per Month. The Mazagon Dock Limited (MDL) officials are clearly mentioned in the official notification the applied contenders must face Written Exam and Personal Interview. Aspirants who clear both the rounds they will get a job in Mazagon Dock Limited (MDL). From this article, all the candidates must find complete details such as Age Limit and Age Relaxation, Selection Process, Application Fee, Salary Details, and Important Dates. Also, we request each and every applicant must follow the given instructions and submit the application form before 17th October 2017. Moreover, all the MDL Technical Staff Openings 2017 details are clearly given in the below section. And also refer the official website of Mazagon Dock Limited (MDL) for more updates. Keep visiting our website sarkarirecruitment.com and get regular updates. 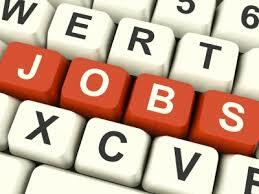 Hope given information is useful for the Job Hunters who are looking for latest Central Government Jobs in India. More details you can also visit the official website of Mazagon Dock Limited (MDL). The candidate’s age limit should not exceed 33 years. Refer the advertisement and check more details about Age Relaxation. Candidates who are willing for apply for MDL Recruitment 2017 they have to pay Rs. 140/- as application fee. For OBC and General category aspirants are exempted from paying the application fee. All the candidates who had applied for this jobs they have to face all the recruitment rounds conducted by Mazagon Dock Limited (MDL). The organization is going to conduct Written Exam and Personal Interview. The candidates who got selected for Technical Staff Jobs they will receive Rs. 6,000 to Rs. 8,000/- Per Month. Willing candidates must refer the official web portal of Mazagon Dock Limited at www.mazdock.com. On the home page click on the Recruitment 2017 Section. Find for MDL Recruitment 2017 Notification link Or Click on the below given link. Read the entire information in the official notification. If you are suitable for Technical Staff Posts they download the application form. Now fill all the required data in a correct manner. Once recheck the given information. The Final Date For Submitting the Online Application Form: 29th October 2017. MDL Recruitment Notification 2017: Is released officially on the official website. That was issued by the officials to recruit the dynamic candidates. The organisation wanted to hire the candidates to fill the vacant positions of the 30 senior engineer, executive trainee etc. So for that, they have mentioned the required details of this post. you interested candidates check the article completely to proceed further. MDL is the short form of the Mazagon Dock Shipbuilder Limited. One should be satisfied all the required qualifications can apply on the official website. The article provided the as much as the necessary details of this notification. The specified last date is 27th July 2017. Post wise the age limit will change. So check the details which of the post you are interested in applying online. MDL Job vacancies 2017 is out in a while. So all the intenders who are looking for the job will grab this chance. To elect the candidates for this post they might be conducting the some selection rounds. Who had applied it will undergo the selection procedure. The officials declare based on the performance of the candidates. The candidates who are the finalist for the interview will get the maximum chance to get shortlisted for the post. The rounds will be based on the organisation rules and regulations. To apply this post online the application fee is ready to pay. For this post, we don’t have proper information regarding the application fee. They will get much more details by following our page. MDL Job openings On the Senior Engineer, Executive posts are dispatched. who have passed the graduation will eligible to apply online.before in time. There is the tough competition for the govt jobs. So it is very hard to get the job. get the govt job is not an easy task. So the applied candidates will start the preparation from now itself. The applied candidates will get the admit card when the officials released. To find the details of the Age limit, educational qualifications, selections process etc. The syllabus pattern is an important stuff for to write the examination. Briefly mentioned the post wise details, the number of vacancies in the table format. Candidates applying for the given Vacancies should have all the Qualifications that are mentioned by the MDL in the Recruitment Notification. To get the details about the required Educational Qualification we suggest the Contenders, to check the Notification which we have given at the end of Article. MDL also specified that they might Conduct some Selection procedure to elect the Best among all the Applicants. According to the source, Mazagon Dock Shipbuilder Limited it is going to conduct the Written/ Personal Interview through which they decided to scrutinise the Performance of the contenders. Aspirants will be placed in the Organization only if they clear the Rounds that are going to be conducted by the Officials of MDL. Click on Specialist, MO & Other Posts.